Vakantie in Jemen - Reisinformatie Jemen. Eén van de meest betoverende landen van het Midden-Oosten is Jemen. Een land waar het vaak lijkt of de tijd heeft stil gestaan. Je reist met landcruisers door adembenemende berg- en woestijnlandschappen vol karakteristieke steden en bergdorpen. De lokale bevolking, voor een groot deel bedoeïenen, is buitengewoon gastvrij. Je voelt je hier echt in een andere wereld, ook al omdat de invloeden vanuit India en Afrika bijna tastbaar zijn. Jemen herbergt een van de oudste culturen ter wereld. Samen met het landschap - uiteenlopend van tropische bossen en hooglanden tot woestijnen - is vooral de architectuur de grote trekpleister in Jemen. De gebouwen zijn in volmaakte harmonie met hun omgeving gebouwd, de kleur komt overeen met het landschap doordat men het materiaal gebruikt dat uit diezelfde omgeving komt. Sana's de hoofdstad van Noord - Jemen, wordt wel beschouwd als het grootste openlucht museum van de Arabische wereld. After the Turkish withdrawal in 1918, North Yemen became a sovereign monarchy, ruled by the Zaydi Imam Yahya Hameed Addin . In an effort to protect his country against harmful foreign influence , he pursued a closed-door policy, thereby depriving his subjects of any chances of development. The resistance movement of the "Free Yemenis" operating from Aden instigated the assassination of the Imam in the revolution of 1948 . However , within a week, his son Ahmed had regained power over the country with the help of the Northern tribes. Reigning from Taiz, he exactly followed the line of his father's outdated, despotic style of government. When Imam Ahmed died in 1962 of wounds inflicted upon him in various assassination attempts, his son Al -Badr took power, Al-Badr supported the revolutionary forces during his father's regime, but when he gained power he turned against the revolutionary forces and swore that he would follow his father's line. This forced the revolutionaries to fight , and on 26th Sep.
1962 the revolutionary forces led by Colonel Abdullah Al-Salal proclaimed the Yemen Arab Republic with Sallal as its first President. Imam Al-Bader had escaped to the north and started a civil war with help of the tribes loyal to him, and support from Sudi Arabia. Egyptian troops came to support of the republicans, while the royalists were backed by Saudi Arabia . The struggle of Yemenis to defend the republican system lasted until the great victory after the Seventy Days siege of Sana'a city in 1968. Aden kreeg de status van Britse Kroonkolonie in 1937, terwijl de rest van het Zuid-Jemenitische gebied het predikaat Aden Protectoraat kreeg als gevolg van een vredesakkoord met zo'n 1300 stamhoofden. Geen inwoners. Wel een militaire basis van waaruit passerende vrachtschepen worden gecontroleerd. Zie Jabal al-Tair Island of de pagina bij het Global Volcanism Program. The Greeks and Romans called the southern part of the peninsula "Arabia Felix", glorified by the fabulous wealth supposedly enjoyed by its inhabitants. Since the domestication of the camel (around 1500 B.C.) large Sabaean caravans moved north along the edge of the desert , covering in 60 - 70 days the distance from Qana on the Indian ocean to Ghaza on the Mediterranean sea. The trade route, which was protected by the kingdoms along the way, became famous as the "Gold and Incense Road". The most prominent and celebrated figure of Yemen's ancient history is the legendary Queen of Sheba (named Bilqis in the Arabic Tradition) , who visited King Solomon during the 10th century B.C. bringing with her a large retinue and an abundance of gold and spices . Challenging Solomon with riddles, she eventually had to capitulate to his wisdom and accept his God . This exotic story has sparked the imagination of countless generations and has found entry into three Holy Books: the Bible the Ethiopian Kebra Nagast and the Holy Koran. The ancient South Arabian Kingdoms which started out as theocracies, all developed in the mouths of large wadis between the mountains and the great desert . The kingdom of Saba with its capital at Marib was the most powerfull, at times dominating all of South Arabia. To the outside world, Yemen is famous for its beautiful landscapes and architecture. However, as Paul Dresch demonstrates, Yemen's modern history is unique and deserves to be better understood. While the borders of most Middle East states were defined by colonial powers after the collapse of the Ottoman Empire, a single Yemeni state was not formed until 1990. In fact, much of Yemen's twentieth-century history was taken up constructing such a state, forged after years of civil war between the North and the South. 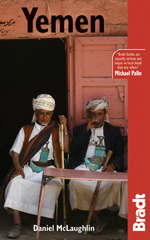 The story is a complex one, but the author handles it masterfully, employing his skills as an anthropologist to re -enact the experiences of those involved through personal encounters and a first-hand knowledge of the region. The narrative is fast-moving and interactive, introducing the non-expert painlessly and pleasurably to a little-known slice of Arab history. Conversely, the expert will find much that is new on every page. Wil je een liedje horen, klik van op 'song titles.